Why was it designed this way and worked in one piece? Why not crochet the main part then the edging separately? I had two reasons for doing this. The first one is that with this design I ticked off a new exciting technique off my "to-master" list, which had been lingering there for quite a long time. This way of crocheting always amazes me and is such a great illustration of crochet magic powers. Can't you just do anything with crochet?! This technique is quite popular among Asian and Russian-speaking crocheters. I have known it as "ribbon lace" technique. The idea is that you crochet narrow strips (ribbons) and create a piece of fabric by joining those strips together (quite similar to hairpin lace crochet). The main feature of this technique is that instead of working in rows all the way across, you work all of the rows within each section, section by section. Usually, when you crochet a lace border, you work it row-by-row along a side or a base row (see pic. A). 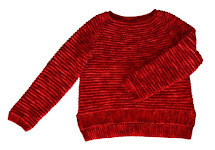 Ribbon lace is worked perpendicularly. You work all rows withing each section (be it a scallop, a shell, a half circle - whichever it is that makes up your edging) and then go onto the next section (see pic. B). I call this method "edging worked across". But the original ribbon lace strips are even more challenging, as they are, in fact, TWO borders facing outwards (see pic. C), which are worked simultaneously. The construction of Peacock on a Walk scarf is shown in pic. D.
I decided to start my designing challenge with a simpler item (an accessory, rather than a garment), but to make things a bit more exciting by adding a center lace panel between the borders. 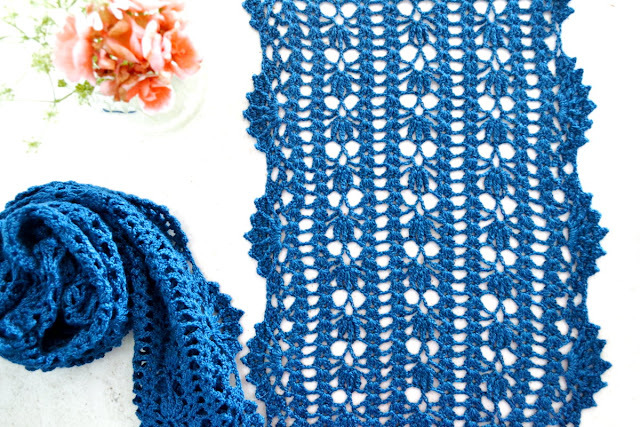 The stitch pattern of the center lace panel is repetitive and the width of the scarf can be adjusted by working more inner pattern repeats. The border sections remain unchanged. Peacock on a Walk, a larger version with three inner pattern repeats. 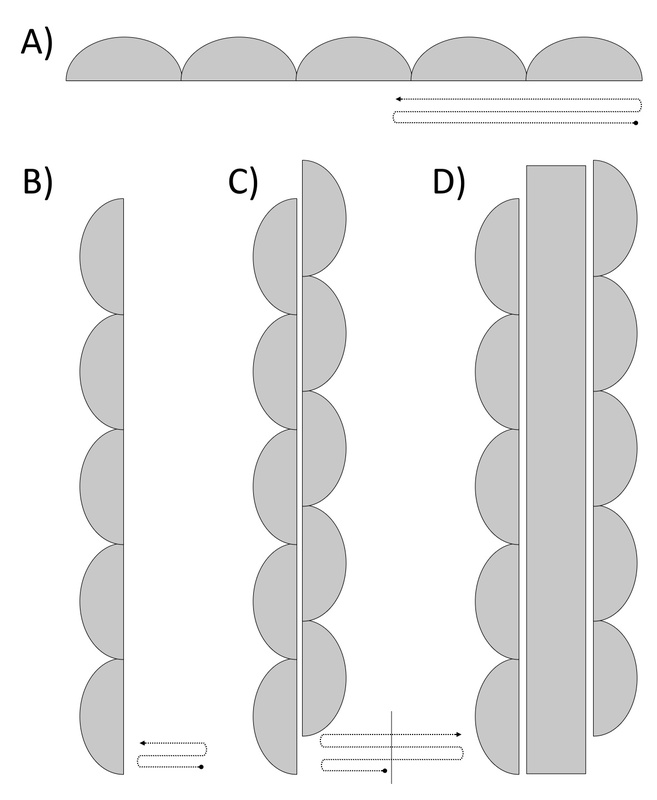 The piece grows in length and, at the same time, in width, and both border sections face outwards, which means that they are worked mirror-like. There are actually three sections worked as a "U": the back-and-forth rows of center panel, and the back-and-forth rows for each of the two borders on the left and the right. This is definitely a challenging (although not too difficult) pattern for someone who likes crochet puzzles! The second reason is all about the practical side and yardage. You can use all of your yarn ball without worrying about the yardage at all. Just stop at the end of any pattern repeat and voila! Your scarf is finished and ready to be worn. It is a perfect destash project, because you can use any yarn you like (creating an airy version from lace-weight yarn or a warm scarf using thicker yarn) and use all of it with no left-overs. You can, however, make this scarf in two steps if that's what you prefer. First, complete the center lace part, and then crochet the borders - no problem! But working this scarf in two separate steps makes it more difficult to calculate your yardage requirements. The border sections eat much more yarn than the center lace panel, and the yardage is also determined by the number of inner pattern repeats you decide to crochet. This is why I would highly recommend to make a swatch and to estimate how many pattern repeats you would be able to crochet before starting your scarf. 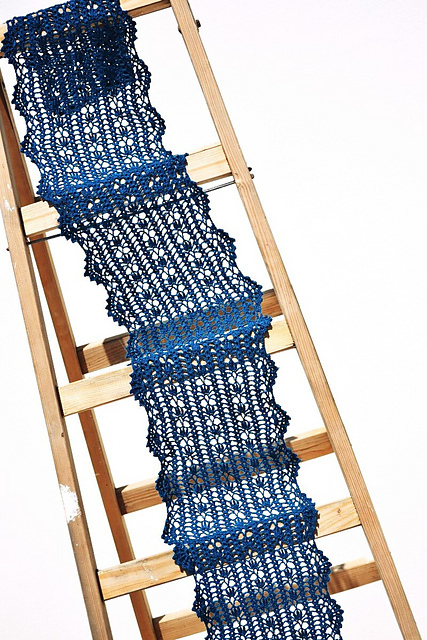 Follow Lena Fedotova's board Crochet Technique: Ribbon Lace on Pinterest.